Are you short of skilled professionals to carry out medical reports transcription? Are you let down by the cost of transcription services that fall outside your budget sphere? Stop looking for a solution elsewhere because we offer one-stop transcription solution to end your woes. 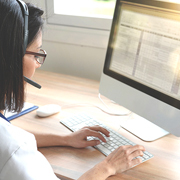 Partnering with professionals who are familiar with medical reports transcription can ease your burden while letting you focus on quality practice and patient care. Outsource2india is a go-to partner for medical reports transcription services because we have been in business serving clients for nearly two decades. Beyond our expertise, we also make sure you get a usable transcription that streamlines patient care, claims filing etc. Our customizable medical reports transcription services adhere to HIPAA compliances and are available in the format and language of your choice. Filing medical records without error is essential in transcription of physician operative notes as it helps physicians to rely on record transcriptions to understand the operative case before providing medical care to patients. At O2I, we value the trust that physicians have upon us by turning their dictations into physician operative notes transcription at a cost-effective rate. We transcribe the discharge summary, which is a comprehensive synopsis of the hospitalization. This record contains consumables, treatment & medication expenses, laboratory tests, and miscellaneous services used by patients during the stay at a hospital. The conclusion of discharge summary transcriptions will include proposal, medical advice, and patient follow-up details. The reports we transcribe can help in optimal patient care after the discharge. If you have SOAP reports that require transcription we have you covered. The SOAP notes delivered by medical offices may need transcription for assessment of patient cases and optimal treatment approach. When healthcare facilities and physicians receive a large volume of SOAP notes it may pose challenges without an organized way of record-keeping. Our SOAP note report transcription can save you from documentation hassles without stretching the budget. Consultation reports are mostly created in a jiffy and may contain errors and intelligible values that might pose challenges at a later stage. Our medical report transcriptionists can unburden your concern by digitizing the consultation reports for billing, record-keeping, and insurance purposes. Our knowledge of the healthcare terminologies and medical practices enables accurate transcription of consultation reports. Why Choose Outsource2india for Medical Report Transcription Services? We possess more merits than any competition to become your trusted partner in medical report transcriptions, thanks to our team who transcribe each report with care and quality to ensure that you are satisfied with the results. For 20 years we have adhered to HIPAA compliant practices and paid attention to quality, so we are rewarded with ISO 9001:2015 certification. O2I handles data security with high importance. We are ISO/IEC 27001:2013 certified because we meet the information security needs of customers with complete knowledge and expertise in managing confidential data. Our transcriptionists are contractually bound to maintain the confidentiality of the task because they sign the non-disclosure agreement before committing to the project. Being a leading provider of medical reports transcription services in India we know that our commitment to quality medical reports transcription services is critical to keep us in business. After completion of the medical report transcription, our proofing experts will run quality checks to ensure that the reports are accurate and complete with limited scope for errors and rework. Outsourcing medical reports transcription can highly benefit your practice because we understand that most clients are concerned about the quick completion of medical reports transcription. We have the skill and expertise to shorten the time needed to transcribe medical reports so that other administrative functions such as claims filing and billing process can be accelerated without efforts. Scaling is simple and fast because we follow a customized system that lets you choose a best-fit solution for your business. O2I's medical reports transcription services can help you can easily scale up or down with ease depending on your practice's needs. Why let yourself be consumed by cost concerns when we can fully customize medical reports transcription services to meet your primary needs? Talk to us and we will assist you to select affordable medical reports transcription services that fit your budgetary peaks. We don't like to keep our customers waiting when they call or send us emails on medical reports transcription. We run global contact centers that remain operational on all days. Additionally, we provide a dedicated agent to assist you personally so that any time you wish to reach us, you are assured to get a lightning fast response anywhere, anytime. We are a team of passionate medical reports transcriptionist holding a specialized license. Our vast team of 200+ professionals delivers unmatched results by following strategic business models from our global delivery centers. With 10+ years of experience and knowledge in AHDI/AAMT standards. Our infrastructure includes physical, technology, and security apparatus. With each infrastructure subsets seen as a pillar of quality services, we empower our team to commit to medical reports transcriptions without slack in quality or accuracy. Sending your clientele's confidential data to us requires a highly secure channel and strategy to avoid the data from ending up in wrong hands. Therefore, we provide a secure FTP and VPN so that your data can find its way to us in a secure way without stumbling across obstacles. Our contact centers are open throughout the year on a 24X7 basis so that all client concerns can be swiftly addressed. We can be contacted via emails, phone calls, and web chats. You can dial us in without concerns about the time zone. Hi, I am pleased with the support. The response time and communication are fine. Knowledge about billing and claims is excellent. All the best! Outsource2india has emerged as an expert medical reports transcription provider by successfully solving the transcription needs of over 250 healthcare facilities, hospitals, and private practitioners. We consider it as a cost-effective alternative to digitizing your medical reports without losing the meaning or accuracy. With skill in interpreting different style of dictation and accents, we are ready to serve your needs with agility. Our global offices are secure, advanced, and tech-enabled to handle most healthcare BPO needs in stipulated time. We also provide other transcription services that include radiology transcription, discharge summary transcription, neurology transcription, and more. Reach us now if you are looking for a cost-effective medical reports transcription solution to increase revenue.